Home / Blog / Borders / Protea Blog…Take Two! Last month on my blog I posted about the Protea Squares quilt made with the entire Protea Bundle. One of the questions asked by a customer about the larger version of the quilt was, what would happen if you put the dark squares in the center instead of the light. Well, we thought it would be fun to see as well. Here are both versions without borders. It is clear that they are quite different. As you saw last time, the border that is added to the quilt can also make a difference. With each of the Protea web special mini-bundles we also offer one or two border print coordinates. These look good with the individual mini-bundles as well as the complete grand bundle. We selected these two Rajasthan borders for this month’s bundle. I opted for a different treatment of the borders this time and added my more typical border of the narrow and wider border print strips and another fabric in between the two. To determine the width of the middle black border, I once again went to my Golden Gauge Calipers. The wide border stripe is 5” so I put the calipers across the five-inch strip and that told me that the black fabric should be 3” wide. (5 x .618 = 3”). You can see here the same border design and the same border treatment with only the color change in the border print. What a different impact the two present. I love the dark centers with yellow cast border, and how do I get the calipers. What is rule for using them. I went on Quilters run last year. I’m a hundred miles south of you so it’s a bit of a jaunt up there. The calipers are available on our website, along with a blog post about how to use them. Hope you find them helpful! 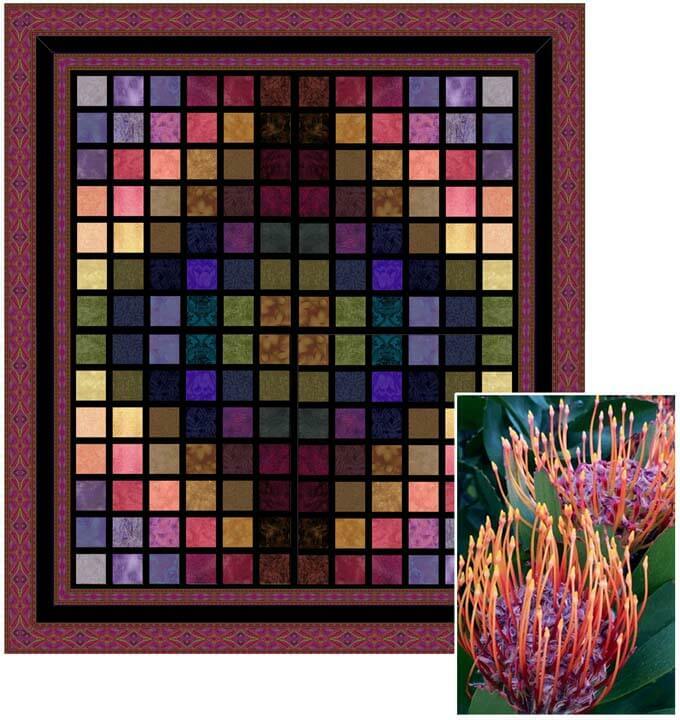 Where is the pattern for the Protea Squares quilt? It was adapted from a pattern, Potomac Squares, which is a free download from the blog mentioned above. I love the photo and the fabric collection. I’m making a bed runner and would like to add a print of the photo on my bedroomwall. Is it possible to get a high quality jpeg file of the photo? Please e-mail us separately at service@jinnybeyer.com so that we may assist with your question.